« Driving and diabetes: changes you must be aware of! Menarini Diagnostics – Glucomen BG Meters. 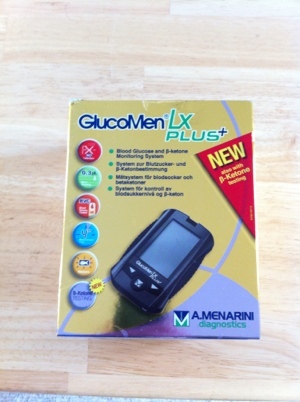 I just wanted to share some info regarding blood glucose meters and a superb company called Menarini Diagnostics who have a range of blood glucose meters called GlucoMen (LX PLUS and GM) which I have been using for a while now and found them easy to use, the customer support team have also been very helpful. Menarini Diagnostics was established in the UK during 1987. The company is now established as one of the fastest growing diagnostics companies in the UK with annual growth in excess of 20%. To date Menarini has already placed more than 700 analysers of various types in the UK market. MDUK are market leaders in the field of diabetes diagnostics, with leading edge systems for HbA1c, blood glucose and continuous glucose monitoring. Nearly 60% of all HbA1cs in the UK are performed on our lab systems. That’s more than 1 million people relying on MDUK HbA1c systems every year. Over 1 million self tests are performed on GlucoMen blood glucose meters every day across Europe. 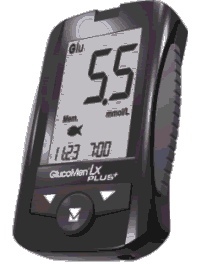 GlucoMen LX systems to help manage their diabetes at home. I have been using the Glucomen LX PLUS for a while now and when I first received the meter it was in a lovely gold box so also a little bit of bling (ha ha), anyway sorry back to my thoughts…..
MDUK’s GlucoMen LX PLUS is a blood glucose meter that incorporates a 2-in-1 blood glucose and ketone testing facility. The ketone testing is particularly useful for insulin users and those who may wish to test their blood ketone levels. ** Coloured covers to personalize your device – hmmm funky. ** The device has a rubber grip, which makes it easy to use and prevents it sliding off surfaces. Alternative site testing is available for blood glucose tests however ketone testing should be done on the fingers alone. The GlucoJect Dual S lancing device that comes with the meter has Comfort Zone technology designed to reduce pain when testing, this is one the best lancing devices I have tried. A number of different coloured skins (10) are available for use with the meter. More information on GlucoMen LX PLUS along with diabetes education and videos can be found on the company website www.glucomen.co.uk. They also have a facebook page with latest news and updates. At the end of the day it’s down to your personal choice but this is certainly a meter that is worth trying.